On Thursday, Guy had a family emergency and had to postpone his game against John. I played black against Bob Collins. We played a Nimzo-Indian. 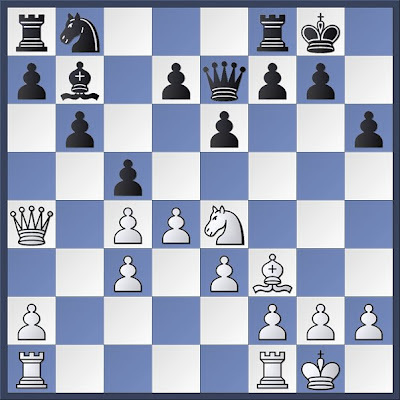 After 14 Bf3 we reached this position and i avoided some real nastiness by responding with ... Kh8. Bob called me a 'Spoilsport'. Not much happened after this and i accepted Bob's offer of a draw on move 20. This game was not played on the night (at least not at Wigston), but the LRCA website reveals that David took the point. David Reynolds is on 2.5, Bob Collins and myself are both on 1.5, John Manger and Howard Phillips are on 1.0, and Guy is on 0.5. In the middlegame, Ray's bishops were raking the squares around Andy's exposed king and his rooks were on the centre files. A mating attack looked inevitable, but Andy managed a bit of a counter attack before being overwhelmed. Dave 'The Jammy Dodger' Ricketts, playing with the White pieces, had been reading up on the Barry Attack all week, but went wrong on his first move when, on auto-pilot, he opened with e4 rather than d4. The opening became a Grand Prix and initially Dave's position had looked good, but this disintegrated. Down in the bar, John and i saw Conor getting a refill and asked him 'Have you done him yet?' and his confident response was 'Not yet'. In fact, this was knife edge stuff and Hacker Dave pulled off a mate whilst only one tempo away from being mated himself on the back rank. In Mick Slater Vs Stan Parsons, both seemed determined not to win and a draw was eventually agreed about half an hour after everyone else had finished. Next week, there will be a club night on Tuesday, but no matches. Our AGM will be on Tuesday 17th July at 7.30PM. After this, (our very low) annual subs become due immediately. So, bring your cheque books. The Nottinghamshire County Championships were held last weekend at the Bramcote Memorial Hall, and I promised a blog "whatever rubbish I play". Fortunately, for me at least, there was rather little in the way of rubbish. After deciding against entering the U160 section I was in the eight man (well, six man, one woman, one junior) U135 section. The first round went well, as I went a piece up as white before sacrificing a bishop and knight to win black's queen, at which point my opponent resigned. A good start. The second round did not go quite as swimmingly, as I went a pawn down as black in a Caro-Kann. Some weak moves from white, however, allowed me to win eventually win back the pawn, before a discovered check meant white would lose a rook. Two from two. Round three saw me with white against the other 134 graded player in the section, at that point on 1.5/2. Against the Pirc I won a pawn just out of the opening, before defending against some black threats down the open h-file. After establishing a passed pawn and forcing the queens off, I saw off a final attack before black resigned. A very successful first day. Sunday morning saw me drawn, as expected, with black against 2nd place. As no-one other than the two of us had more than 1.5/3, a win for me would mean I couldn't be caught. Another Caro-Kann and we approached the middle game fairly equal, only for a couple of passive moves from white allowing me a quick attack. Though this was repelled, it would cause problems for white later on. Luckily (for me), I'd calculated correctly. My opponent knew his queen was defending against a potential back-rank mate on d1, only to have overlooked a second threat from my queen, positioned on a5. With his remaining rook leaving his first rank, ...Qe1 won me the game and the title. Of course, being on 4/4 meant I had to take the final game seriously. Instead I played too quickly, and it was more luck than judgement that saw me reach the endgame a pawn up. Then, strangely, my opponent offered to swap the remaining rooks off, leaving me a simple win. 5/5 and a TPR of nearly 180 means it's unlikely I'll be eligible to defend the U135 title next year! We all had the black pieces for the first game. In my game, on board 3, we swapped off queens early and i became tangled up in some pins - an early loss. Hacker Dave did rather better on board 4. Mike agreed a draw on board 1, and John lost on 2. At the half way stage, we were down 1.5 points to 2.5, but we would be playing with the white pieces in round 2. After the break, Dave went a couple of pieces up, then dropped a queen, but still won. I went a piece up and commenced swapping bits off, picking up another piece towards the end. Mike looked to be in a lost position with king and bishop against king, bishop and two passed pawns on the f and h files. Miraculously, Mike was able to take one of the pawns with his king and pin the remaining pawn to his opponent's king leaving him with insufficient mating material - half a point well saved. With the scoreline being 4-3 in our favour, and both players being short on time (John with less time) Shaun offered a draw. John accepted and, in so doing, won us the match. No more chess until tomorrow night. Friendliewise, we played a few games of pairs without consultation. No club night this week. We have a Harrod Cup fixture away at Melton on Wednesday. On Thursday, we have the lower sections of the County Championship at Wigston Liberal Club. Dave Vs Conor (The Barbarian) Reid - Conor looks to be quite handy. This one should be interesting to watch. No pressure, Dave. Come down and watch, if you are free. I'm doing great in Nottingham, thanks. I finally got married a couple of weeks ago, and just back from the honeymoon today. Apparently 2.Ne2 is a some-time favourite of Nigel Short against the C-K. However, it's the Nottinghamshire County Championship in a few weeks (it's run as a five round swiss congress here, over one weekend) so I promise a blog on that, whatever rubbish I play! I joined Gameknot a couple of months ago, but the site has barred me now because I use ad-blocking software. It'll only let me continue if I pay for a premium membership. I'll see if I can set up another account to get round that, and I'll contact you on there if I can. Good luck in the cups and county championship! Congratulations from all at the Heathcote. I have added a link to the Gameknot website. This allows you to play correspondence chess for free. I have been playing on this site for a few years and treat it as practice for over the board play. I am known as cjr30 and am happy to accept challenges. Tigerray is also on there, and i notice that golfman52 has also very recently joined. There will not be any chess at the Heathcote this week. The pairs competition will not happen at the Red Admiral on the Wednesday either. Heathcote Vs Willowbrook - Now confirmed as Tuesday 12th June. Melton 1 Vs Heathcote - Now confirmed as Wednesday 20th June. I will amend this post as dates are confirmed. It was the second round of the Championship Section of the County Championships on Thursday 31st May - but i don't know how any of our guys got on. Graham Booley Draw by Default. Just for interest, Brandon Clarke is entered in the Championship Section of the County Championship this year (with draws by default in the first two rounds). Although Brandon has not played for us since our move to the Heathcote Arms a few years ago, he still sometimes plays under the Littlethorpe flag. The ECF grading database has the 15 year old Brandon on a current grade of 215. See you all on the Tuesday 12th June. Our first team plays at home in the Wylie, and if neither the dining room or skittle alley are booked out, we should be able to play some fairly noisy friendlies away from the match.